I'm hoping I can word this in a way that lets you know how much I loved this Patisserie, so here goes. Go, go now. Stop what you are doing and go directly to Strawberry Fields Patisserie. Don’t bother about passing 'Go' and collect two hundred dollars. Grab a friend or two or three, and just go. I promise you will not be disappointed. I am just sad that it took me so long to find it, especially when I live so close. Which now I realise may not be a good thing as this morning I dropped the kids off at school and went straight there again for a quick coffee and a morning treat. I think I am addicted. 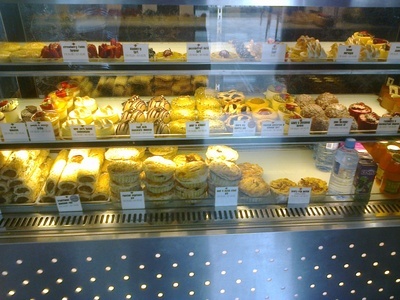 This award winning Patisserie is situated on New Canterbury Road, Dulwich Hill. It sits way back from the main road in what seems like its very own courtyard. The seating is outside only under café umbrellas, and with the sun shining and the kids at school - this was exactly where I was meant to be. Needless to say the Patisserie was full. What I did see were a lot of mums with their children, and the fact that it does sit in a courtyard environment meant that the kids were not restricted to sitting at the table the whole time. They were able to move around and have a play, and parents could feel relaxed that they were still in sight. From the moment we walked in, we knew we were not leaving without taking half the shop with us, and that’s not including what we were going to actually eat while we were there. The poor girl behind the counter must have thought I had never seen desserts before as my eyes were sparkling. I know this look; my children have the same look on their faces when they are in the toy shop, and I tell them they are allowed to buy something. As you enter the shop it is quite small, and is divided into two sections. The kitchen is to the left, and the products to the right with a tiny coffee making area. However it works well. It was early morning, and with so many people in there it was a bit of a shuffle to get to the front. You will find though it is definitely worth the wait. There is quite a selection of products, and with a commitment to freshness; the Patisserie only makes up to 40 of each item per day. Additionally, I also love the Dear Prudence Pie filled with pumpkin, feta and leek ($5.50 take away/$6.00 eat in) or their famous John Scroll. The latter is a delicious mixture of an onion and bacon scroll with a poached egg on top. After much deliberation we chose the Raspberry and Blackcurrant Mousse ($5.20 take away/$5.70 eat in); as well as the Oreo Mousse ($4.90 take away/$5.40 eat in), and one Strawberry, as well as one Passionfruit Petit Four ($1.50 each). 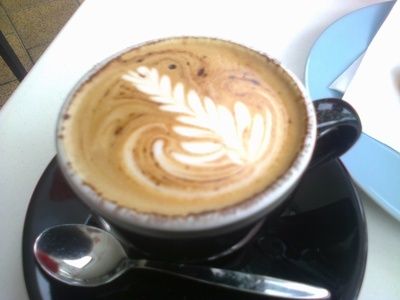 With a range of beverages including espresso ($2.70); cappuccino ($3.50 small, $4.00 large); hot chocolate ($3.50 small, $4.00 large) baby chino ($1.50) and tea ($4.00) - we were certainly in no hurry. Left: Strawberry Petit Four. Right: Passionfruit Petit Four. On their blackboard in front of the shop, it states that their products are baked fresh daily. I can guarantee you that after one mouthful, you know that what you are eating has just been freshly made. The Oreo mousse just melted in my mouth. It was light, fluffy, smooth, soft and moist. I could go on and on about how beautiful this dessert was, however I really think you need to try it yourself. The petit fours had a crisp shell, and the filling had a real strawberry and passionfruit taste. All three desserts were exceptional. This was without a doubt a wonderful experience. The staff were so lovely, and had all the patience in the world for us as we took so long deciding on what we wanted. If you are in the area, be sure to stop in at Strawberry Fields for a special treat. On the other hand, if you live some distance away - it really is worth the trip. You will be glad you went. Where: Shop 2, 420 New Canterbury Road Dulwich Hill NSW. Parking is available at the Loftus Street Carpark. Why: Great atmosphere. Delicious desserts.